Dark matter is the cosmologists' current explanation for a discrepancy in the amount of mass that our current models think should be present in the large structures we have observed. Dark matter accounts for unobserved mass that we think should be there. First, we should say that we have not ‘done the maths’ specifically with dark matter models. However, we propose our mechanism as a way for a vacuum flux to permeate and be retained in regions of matter, and for that flux to self-interact in a way that creates non-conserved fermions as points of interaction that change the effective gravitational field. After devising the mechanism for fermion formation, we explored its expressions further, and found that there would be 'clouds' of fermions surrounding regular matter. These fermions would not be conserved like ordinary matter, and would resemble quantum fluctuations (but with a deterministic origin!). They would be formed only once, then radiate away as bosons, effectively disappearing into vacuum, perhaps to form other fermions elsewhere. This flux is generated by lots of matter, from a cluster, galaxy, black hole, or filament. The individual bosons of this flux will be of low mass-energy, so they may create a plasma. That last point is important: that the bosons have low mass-energy. This prevents fermions from becoming localized; the low mass-energy allows bosons to propagate far before being collapsed in a fermion event. This means that the fermions will be comprised of different bosons every time one is formed, which describes a plasma quite well: the result is a soup of particles that interchange with each other, where fermions have a different identity for each occurrence. Conversely, bosons having significantly greater mass-energy would create localized and conserved fermions, which describes ordinary matter. Indeed, our vacuum provides the interations that help localize the regular matter. In our human environment, neutrinos can be regarded as such a flux: fermion identity is not sustained in the sequence of interactions along a boson's path. Incidentally, we regard this flux as providing the Casimir effect, and a pressure that sustains the constitution of ordinary matter: the 'vacuum' part of the wavefunction. In high-energy environment, like 'quark soup', or 'quark–gluon plasma', bosons of high mass-energy are so crowded that their propagation shells overlap before they typically collapse, leading to identity-swapping of constituents, and no hadrons of conserved identity. Dark matter may be present in rarefied environments, but only where high flux permeates from nearby dense regions that generate the flux. They partake in the weak interaction. They don't emit photons, but may interact with photon constituents. By our construction, photons are emitted as pairs of bosons, generally by conserved structures. It is difficult to conceive of a scenario where our dark matter could emit light, unless it is compressed to very high density (with radio emission wavelength as a function of density), forms a coherent dense cloud with the help of other matter, or in highly improbable instances. They act as new sources for vacuum bosons, allowing them to be sources for gravitational interactions, and waypoints for gravitational lensing paths, while preserving the structure of photons. Fundamentally, we assume that there is no aether. However, because all fermions radiate themselves as bosons, and the conditions for further fermions can occur in the intermediate space, we can show that an aether-like sea of fermion events could form if there is sufficient surrounding matter and time for its bosons to propagate and intersect (fig.1). 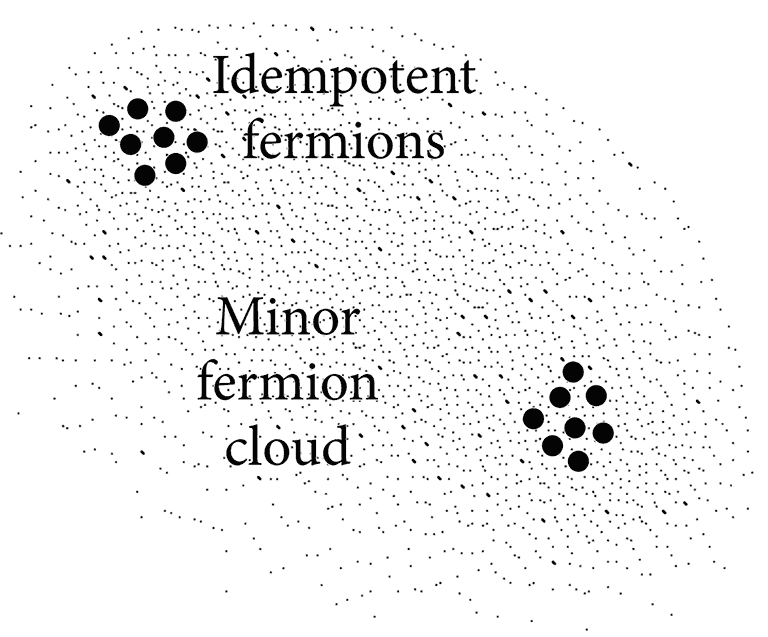 Fig.1: Dark matter as a fermion cloud around matter. This is not a continuous background aether, is not fundamental, and may seem random if there is no knowledge of the specific boson sources. The individual fermions will be instantaneous like all other fermions, and will not propagate as idempotents, so they will not be seen to form and move around. Instead, they act as interaction points for fields to influence idempotent fermions or composites.